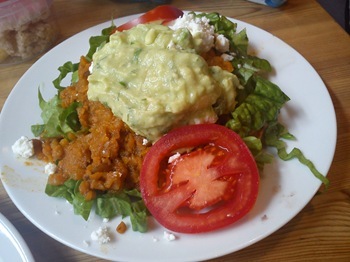 I think that it’s probably harder to find decent Mexican food in this country than it will be for punters to buy chips on their own at the Olympics. 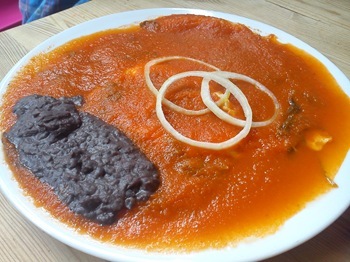 If you live in London, you can brave the queues to eat good street food at Wahaca, but aside from a few other mini-chains doing great burritos, such as Benito’s Hat or Chilangos, most Mexican fare on offer in the UK is of the damp cardboard Tex Mex cheese ‘n nachos variety. 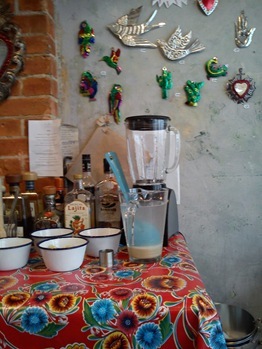 How ecstatic was I when Casa Morita opened up in Brixton Market touting its Oaxacan-inspired menu– the food here is so exciting that I will willingly brave the uncomfortable-ness of the chairs to eat here while trying to balance a baby on my knee, it’s that good*. 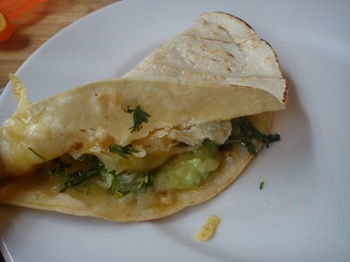 It’s light, fresh, and tastes really really different – smoky chipotle, fresh lime, crispy tacos, authentic corn tortillas all popping with clean flavours. Double yum. Go, go! 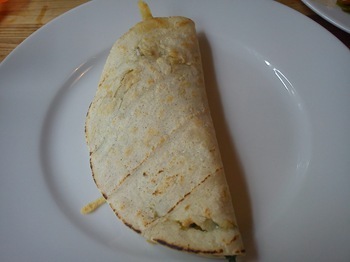 A delicious filling of melted cheddar, feta, guacamole, coriander – really fantastic, I could eaten 10 of these. 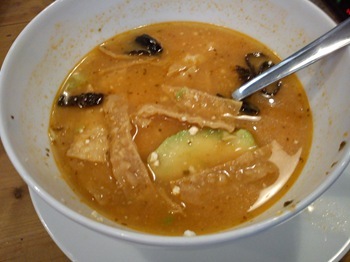 Excuse the bad pic – this is Sopa Azteca, a smoky tomato broth containing fresh avocado, feta, strips of tortilla and dried chillies. So good I had to eat half of it before I remembered to take a photo. 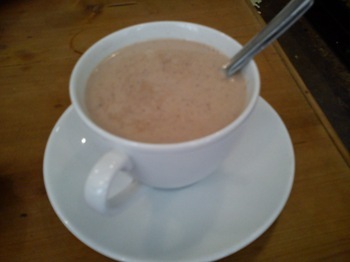 A cup of Mexican hot chocolate, aromatic with cinnamon and cloves. Perfect treat for anyone needing a spicy pick-me-up. The waitress is a little, uh, ‘mellow’ when it comes to speedy service, but the cafe is friendly and relaxed. Nobody batted an eyelid as my baby daughter proceeded to throw most of her lunch all over their floor, furniture and walls. You can buy Mexican produce, such as Ibarra chocolate and tinned black beans, and choose from a vibrant display of Day of the Dead tin wall ornaments to kitsch up your home. I can’t wait to come back when I can drink lots beer, fall over and make a real evening of it. 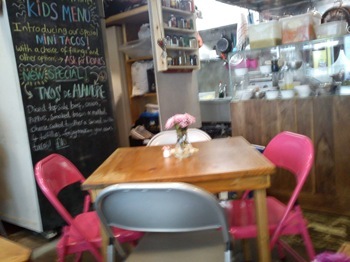 *To be honest, I find the most exciting places to eat never have high chairs. Just cause I have a baby doesn’t mean I want to be constricted to bland kid-friendly places like Giraffe! Oh! I want some of that Mexican food quickly please! So tasty.